A good indication any new technology or business model is starting to mature is the number of certifications popping up related to that product, framework, or service. Cloud computing is certainly no exception, with vendors such as Microsoft, Google, VMWare, and IBM offering certification training for their own products, as well as organizations such CompTIA and Architura competing for industry neutral certifications. Is this all hype, or is it an essential part of the emerging cloud computing ecosystem? Can we remember the days when entry level Cisco, Microsoft, or other vendor certifications were almost mocked by industry elitists? Much like the early Internet days of eEverything, cloud computing is at the point where most have heard the term, few understand the concepts, and marketing folk are exploiting every possible combination of the words to place their products in a favorable, forward leaning light. So, what if executive management takes a basic course in cloud computing principles, or sales and customer service people take a Cloud 101 course? Is that bad? Of course not. Cloud computing has the potential of being transformational to business, governments, organization, and even individuals. Business leaders need to understand the potential and impact of what a service-oriented cloud computing infrastructure might mean to their organization, the game-changing potential of integration and interoperability, the freedom of mobility, and the practical execution of basic cloud computing characteristics within their ICT environment. 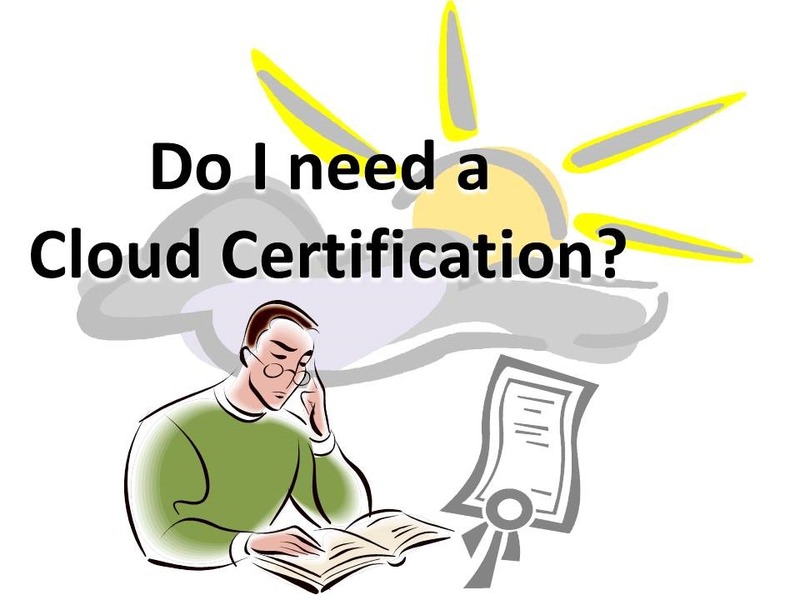 A certification is not all about getting the test, and certificate. As an instructor for the CompTIA course, I manage classes of 20 or more students ranging from engineers, to network operations center staff, to customer service and sales, to mid-level executives. We’ve yet to encounter an individual who claims they have learned nothing from attending the course, and most leave the course with a very different viewpoint of cloud computing than held prior to the class. As with most technology driven topics, cloud computing does break into different branches – including technical, operations, and business utility. The underlying technologies of cloud computing are probably the easiest part of the challenge, as ultimately skills will develop based on time, experience, and operation of cloud-related technologies. The more difficult challenge is understanding the impact of cloud computing may mean to an organization, both internally as well as on a global scale. No business-related discussion of cloud computing is complete without consideration of service-oriented architectures, enterprise architectures, interoperability, big data, disaster management, and continuity of operations. Business decisions on data center consolidation, ICT outsourcing, and other aspects of the current technology refresh or financial consideration will be more effective and structured when accompanied by a basic business and high level understanding of cloud computing underlying technologies. As an approach to business transformation, additional complimentary capabilities in enterprise architecture, service-oriented architectures, and IT service management will certainly help senior decision makers best understand the relationship between cloud computing and their organizational planning. While reading the news, clipping stories, and self-study may help decision makers understand the basic components of cloud computing and other supporting technologies. Taking an introduction cloud computing course, regardless if vendor training or neutral, will give enough background knowledge to at least engage in the conversation. Given the hype surrounding cloud computing, and the potential long term consequences of making an uniformed decision, the investment in cloud computing training must be considered valuable at all levels of the organization, from technical to senior management.